In an effort to assist the native forests on the ridges and slopes of Waimea Valley, the Conservation team and volunteers have been clearing invasive plants and planting tens of thousands of native Hawaiian plants. Several areas with lama, wiliwili, koa, ‘ohi‘a lehua, and alahe‘e have been identified as key restoration sites. Restoring the upland forests is known to enhance the watershed and therefore improve the water quality and quantity for the Valley. We are asking for your kokua (help) in restoring our forests by coming out to volunteer on Forest Restoration Work Days. Please read the following FAQs before submitting your RSVP to attend Hānai 'Aina. RSVP IS REQUIRED TO ATTEND. You will be emailed back with a confirmation. Dates are posted on the homepage informational flyer. Dates vary month to month. Please realize that you are committing to the entire time 9am to 3pm. Unfortunately, we are not staffed to hike down earlier with individuals. For more information please contact our Volunteer Coordinator at volunteers@waimeavalley.net or call (808)638-5855. 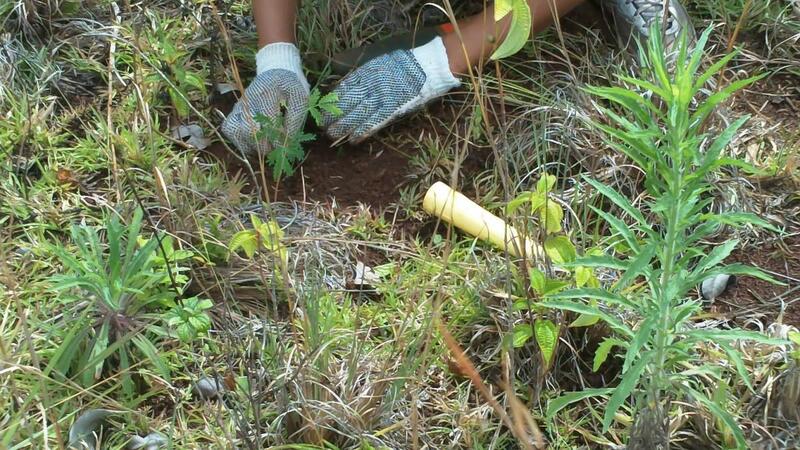 You will be assisting the Conservation team in native Hawaiian planting and invasive species control. Please park at the main guest parking lot and walk to the Botanical Office located past the Visitor Center parking lot. Parking is free. Do I need to fill out any volunteer paperwork? What is the maximum volunteers per date? We are looking for up to 20 people for each date (ages 12 and up). How do we get to the ridge? You will be meeting at the Botanical Office with the Conservation team and hiking with your belongings up to the ridge. The terrain is easy to moderate for Kalahe`e Ridge (45 minutes) while the truck carries some people and all of the tools, plants, and equipment. What should I bring to be prepared for the hike and work day? The items below are highly suggested to keep you hydrated and work ready throughout the whole work day. There is very little shade on the ridge and it can get quite hot! Is there any charge to attend volunteer day? For more information please contact our Volunteer Coordinator at volunteers@waimeavalley.net or call (808) 638-5855.